Ok, it wasn't just often injured Canadian third baseman Brett Lawrie that was sent to the Athletics. It was also Kendall Graveman, Franklin Barreto and Sean Nolin. But Donaldson is one of the best players in the game. If you look at WAR, only Mike Trout has been more valuable than Josh Donaldson among position players the past two seasons. Josh Donaldson's wins above replacement is 15.4. He finished fourth in 2013 and eighth in 2014 in AL MVP voting. Sure, we gave up a lot of prospects along with Lawrie, but look what we got back. This move improves the Jays, and has me pretty excited about 2015. Overall a great trade for the BJays. Sorry to see Lawrie go. He's played less than half the games in the last 2 seasons with injuries. He plays hard & competitive & a good 3rd base. His bat lacks some punch but only 24 years old. Prospects given up weren't the TOP prospects (Sanchez still here as he is the best in Jays system now). All young players in "the system" are prospects & it's the GM & scouts job to determine their future. 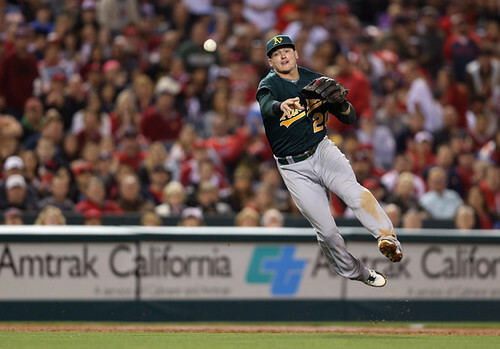 What we get with Donaldson is a repetitively young great offensive & defensive player. Imagine the batting order next year - Reyes, Martin, Bautista, Encanarcion & Donaldson - top 5 will be lethal. Good luck Brett as you are a true Canadian who promoted BBall in Canada & made a difference. Great trade all around. Now can we keep Cabrera?? Great trade! I never was a Lawrie fan. Perhaps he will do better in Oakland. If we can keep Cabrera which Jays won't, where does he bat? Just like 2 years ago with all signings this off season & the Jays were brutal. Pieces in place but still a problem. Need bullpen help as TOP priority & nothing done so far. I hope Brett remembers to pick up his dry cleaning before he moves to Oakland. @NW, your comment actually made me laugh out loud!